An information graphic need not always be a big, elaborate production on a centerspread or double truck, featuring meticulously prepared 3D art and heavily “Photoshopped” images. Sometimes, it is a one-column chart. A simple map. Or a sketch-like diagram with a distinct, unfinished look about it. Or something that just works. 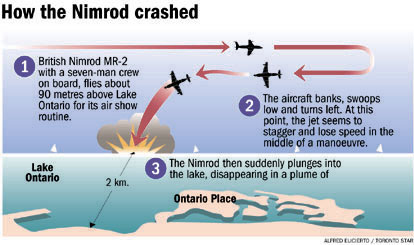 During the Toronto Air Show on Sept. 2, 1995, a British-made Nimrod MR-2, performing a routine flypast, crashed into the waters of Lake Ontario, killing all seven men on board. With little information available at the time, I had to produce a quick, simple explainer for that night’s edition of the Toronto Star. Like clockwork, a rescue mission was set in motion immediately after the crash. 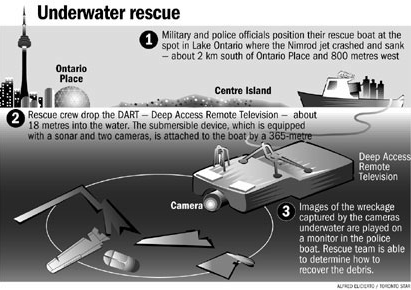 A police rescue boat dropped a submersible Deep Access Remote Television (DART) 18 meters into the water about 2 kilometers south of Ontario Place. A sonar and two cameras relayed images of the wreckage to a monitor in the police boat. The images aided the rescue team in recovering bodies and debris. The recovery effort was captured in a simple graphic that I put together the following day. Designed as a sea patrol and anti-submarine aircraft, the Nimrod began service with the Royal Air Force in the U.K. more than 30 years ago. It is based on the de Havilland Comet, the first commercial jetliner, with four jet engines integrated into the wings next to the fuselage. The Nimrod was put in active service during the brief 1982 Falklands War, and also saw action in both the 1990 and 2003 Persian Gulf wars. It also helped enforce NATO’s martitime blockade of the Balkans in 2001. Main equipment: Sonobuouys, radar, magnetic and acoustic detection, torpedoes, bombs, depth charges, Sidewinder self-defense missiles. 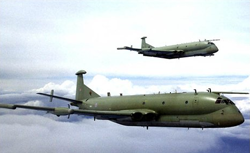 In response to mounting safety concerns surrounding the Nimrod, the British Ministry of Defense, on March 31, 2009, grounded all Nimrods pending a vital safety modification. 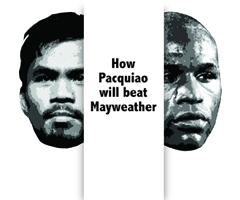 Graphics by Alfred Elicierto, published in the Toronto Star in Sept. 3 and 4, 1995. I really like your writing style. Good info. Regards for putting up : D.